Update on 1/23/2006: The label colors script exposed a XSS vulnerability. It has now been updated to remove this hole - all users are encouraged to install the latest version of the script. After many delays, I've finally gotten around to updating my Greasemonkey scripts so that they run under Firefox 1.5 and Greasemonkey 0.6.4. In fact, these scripts will most likely not work in older versions, and I will not be supporting Firefox 1.0.x or Greasemonkey 0.3.x. Conversation Preview Bubbles (script) was the most straight-forward, since I had already done some work to make it compatible with the unreleased Greasemonkey 0.5.x releases. In fact, it seems to work better under FF 1.5/GM 0.6.4 - before the script did not trigger for label and search results views, but now it does. Saved Searches (script) required a bit more work, and in the process I decided to clean it up a bit. The result count functionality was removed, since it was not that useful. The fixed font toggle feature was spun off into a separate script since it didn't make any sense for it to be bundled. I'm also taking this opportunity to announce two scripts that I had previously written and never gotten around to releasing. Gmail Macros adds additional keyboard shortcuts to Gmail. Some are obvious (and have been done by other scripts) such as "t" for move to trash and "r" for mark as read. However, I strove to provide a bit more functionality. For example, "p" both marks a message as read and archives it, when you really don't want to read something (the "p" stands for "purge"). Additionally, the shortcuts can be easily customized by editing the HANDLERS_TABLE constant. More than one action can be chained together by providing a list of action codes (which are contained in the script and were extracted by looking at the generated "More Actions..." menu in Gmail). The other novel feature is for label operations. Pressing "g" brings up a Quicksilver-like display that allows you to begin typing in a label name to go to it (special names like "Inbox" and "Trash" work too). Similarly, pressing "l" allows you to label a conversation with the label of your choosing. If you're wondering why so many of my Greasemonkey scripts are Gmail-related, it's because it's the application where I spend a significant part of my day, thus every bit of productivity improvement counts. Not only do I use Gmail for my personal email, but I also use an internal version for my email needs at Google (as do most of the other Googlers - this constant dog-fooding helps to make Gmail a better product). (the usual) Disclaimer: I happen to work for Google. These scripts were produced without any internal knowledge of Gmail, and they are not endorsed by Google in any way. If you have any problems with them, please contact only me. I can't live without the preview bubbles. Thank you very much for updating these scripts. I was seriously missing the saved searches under FF 1.5. One thing: I personally did like the result count on the saved searches. How difficult would it be to add back in? In the labels list the color still shows (the stuff after the #)--is this intended? cause its kinda annoying to me. I can't seem to get the non-specific colors to work. e.g. using your example of "BLAH ##d52" doesn't color the label whereas "BLAH #red" does. Also, can you embelish a little on where you're getting the code d52 from? I am familiar with 6-digit colors only. Caleb, yes it's true that the labels list still shows the colors. Unfortunately there wasn't anything that I could do about it when I tried. Luka, I've updated the script so that hitting enter will use the first label that matches, so you can just hit that key after entering "xyz" (the key code works on Mac OS X, not sure about Linux or Windows). Alex, the 3-digit colors is a shorthand: #abc gets expanded to #aabbcc and so on. Not sure why it wouldn't work for you. Make sure there are no stray spaces. 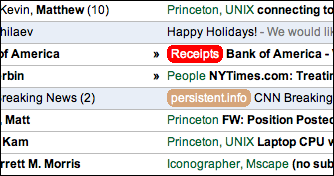 Love the gmail label colors! However, I didn't like having to add the suffixes to each label, especially since they show up on the "folder" list as well and would shift off my number of unread messages for the label. Seems that conversation preview bubles doesn't work for messages in the SPAM folder (it's not a huge deal). Thanks so much for all the scripts! they're awesome! Would it be possible to allow me to show small photo portraits (if I have them) of people who email me? Great scripts however I tried to remove a colored label from an archived message and couldn't, I belive the color tags get passed on to gmail function. Also it would be nice to hide the #color from the label list! hi, i have FF1.5 and GM.6.4 and i can't get conversation preview to work. i installed script a few times and relaunched FF each time. any ideas? awesome! The scripts make Gmail more powerful. Hi, how to change in GMail Macros shortcut for "Move To Trash" from "T" do "D" key? I tried changing script with notepad, but it didn't work. Personaje, those are the trade-offs of the approach I chose. You can try using the method Randy describes in his comment. That won't have those issues, but you'll need to install the modified version of the script wherever you use Gmail. KoreV, the key code for 'd' is 68, you can try changing line 49 to that instead of 84. Great stuff, and quite nice for my favorite email service. One addition that I would like to see for gmail (or added via a greasemonkey script) would be archive and go to the next message, and archive and go to the previous message. Likewise, doing a trash this message and go to the next one would also be helpful. I frequently have 8-10 emails, several of which are generated automatically by my server, and I just need to review last night's data and then can trash the mail. It's slow to keep going back to the inbox and then pick off the next one with a mouse click. I run a Squirrelmail installation and really miss these functions (which are part of Squirrelmail). How difficult would it be to add support for mass checking to the macros? I tend to read through a set of messages and when I'm done I select them all and archive. I was planning on figuring out how to do it myself but you've saved me most of the hard work. I'm thinking ma (mark all), mu, mr, ml. Also, is there some sort of rough programmer's reference to gmail or does everybody writing greasemonkey gmail scripts reverse engineer it themselves? Karl, it shouldn't be that hard to add those shortcuts. If you can get a hold of the DOM nodes for the Select All/None/etc. links, you can use the fakeMouseEvent function from my preview bubble script. These are great and a huge help, nice work! Tip: I also made a Persistent Search that was simply an email of your Gmail Macros list. So, i can quickly reference those shortcuts. can someone advise me in layman terms how to install the conversation bubble script correctly. running ff 1.5 and greasemonkey .64....thanks! Great Job about all this. Marry Xmans and Happy New Year!!! Jack, those still work, except you may need to type in more of the name if you have label names that conflict (e.g. if you already have a label whose name beings with "i", you'll have to type more of "Inbox"). I've added the select macros to the macros script. I also moved the read and archive key to D (discard) since P conflicts with move to previous message in conversation view. I was too lazy to to select by label. I lied, I wasn't happy. Added key command summary with ? and changed o from the useless duplication of enter to expand/collapse all in conversation view. Is it just me? Seems like the only greasemonkey script I can run is the one that adds the delete button to Gmail. I have tried running the above scripts and my Firefox 1.5 crashes constantly. I really like the label color script, but I can't stand that Firefox crashes every 10 minutes or less. I love the Quicksilver functionality, but as it is it only searches the labels when the label tab is open. Would it be possible to also search the labels when it is closed? I just wanted to say thank you for your work. I use these scripts all the time. I too, would like to point out that removing colored labels does not work. I have to rename the label (without the #) in order to delete a label from a message. I'm sure this is somewhat of an easy fix. Hopefully that can be updated soon. Thanks! hi, is anybody was thinking about making preview bubbles for news at Google HomePage. I don't know how to do it, maybe i can receive advice about doing it. Any reason this would not work on a mac? I'm not having any luck although I can get it working on a PC. with all of your scripts installed, on windows xp sp 2 with firefox 1.5 and greasemonkey 0.6.4 it will crash firefox if you attempt to open up two tabs with gmail (which i often do). i installed preview js but whenever i right click i am getting the standard right click menu . Could you try to make a script which will allow user to attach a note to mail? I think we can use a mail to make a "note" a script which will tigger a mail to self with the same subject will keep that new mail attached to the conversation. I too have a problem removing a colored label. It appears like color labels show up COLORED under the "Remove" in the drop-down box even though they are NOT colored (that is, they have their #codes after them) under the "Apply". So when Google tries to remove a label, it tries to remove the label WITH its HTML color markup. It can't find these labels, so the labels never get removed. So that seems to be a bug. I had the same error. Do you have the Firefox Gmail Delete extension installed? I read somewhere it doesn't place nice with Greasemonkey. I removed it and now could install the scripts fine. Nope, I don't have the delete extension installed. Hope this isn't a dumb question, but... is there an UNlabel function built into the Macros script? Like, if you accidentally apply the wrong label with your handy "l" shortcut, and you want to remove of it without resorting to that damned dropdown menu..? That said, LOVVVVVE the script. Great scripts. I'm so glad that you got the previews working with Firefox 1.5. I agree with Not Shitashi that the labels thing takes a bit of getting used to. It's so easy to just type in the wrong thing and suddenly it selects that one and, OMG where did it go?!? ;) Ideally, could the Quicksilver thing show a list of labels that match the text that you type in? So for example, I have a label that says "Google", and another for Gigs And Tours. If I type "G", then it'd show those two (and perhaps a third option for "Create New Label") in a list, allowing me to select one. Or alternatively, just requiring me to press enter after typing the label name would be good too. Secondly, I noticed a possible bug in the previews script. If I right click a message that has HTML in it, WITHOUT selecting it first with the tickbox, the preview window appears very tall and thin, meaning I have to scroll horizontally in order to read it all. I managed to test this with emails from BOL.com and theonion.com. I'll have a look at the script for the labels one to see if I can make it need an enter to close. Basically, what was causing the quicksilver window to disappear as soon as it found a match was that it was calling the endLabalAction as soon as selectedLabels had more than 0 elements OR someone pressed enter. I've removed the check for 0 elements so it now waits for you to press enter. You can press the down arrow to show the match, and up to get back to what you were typing. That's what the check for keycode 40 is for. I'm actually in two minds as to whether it should just show a match as soon as it finds one, so if you want it to do that, just remove the if (event.keyCode == 40) statement. Oh, sorry for the triple post, but there's one more thing. In the Recent Searches bit, if there was an option to save that search permanently, that'd be great. Karl, I like your changes, but I have some issues. "?" doesn't do anything for me (on Mac, haven't tried on other platforms). Also, with your changed macro script, when hitting "/", it focuses the search field, but also adds "/" in the field. This doesn't happen with mihai's original macro script. The go to label shortcut (g) conflicts with GMail's gi (go to inbox), and is very annoying. I had to manually comment the code for it from the script. But absolutely a must have set of extensions! Keep it coming! All my GMail scripts broke this morning. I'm not sure if it's Greasemonkey gone mad (for some reason, the yellow bar prompting an install didn't appear on any of them, but the Tools>Install This Script menu option did), though I've uninstalled and reinstalled it - though it kept the settings and I don't know how to purge them. It could also be another of my extensions since I updated a couple. DuplicateTab also broke but worked fine after reinstalling. Finally, it could be some change in GMail that stopped all of them from working. Anyone else found this issue? Update: Seems to be GreaseMonkey doing something strange since other scripts that I installed just as a test for other sites don't work either. I didn't see any of the most recent errors that other's have seen, but I've gotten errors and stopped using the Label Colors script, because it was crashing Firefox almost everytime I would open Gmail. I appreciate all of the hardwork to make these scripts. Even though I had problems with one of them, the others seem to work fine. I'm a newbie to scripts. I've downloaded the latest Greasemonkey and FF and the scripts, I can't replicate the colored bubble labels on the second pic ("Receipts" in red and "persisten.info" in beige). I've read the article and skimmed the comments with no success. Greasemonkey and these scripts (search and macro) lead to a Gmail "lockdown." Gmail auto response says to disable Greasemonkey. Too bad. I quite liked this. (Greasemonkey, a popular Firefox extension, often interferes with Gmail. Thanks for the macros. What I'd love is one that would send the message I'm currently editing. Is that possible? chrispix, I just hit tab and enter. 2 keystrokes yes but still fast. what about preview bubbles for WebClips? Thanks, I always forget that there are buttons right below the edit area. Nice work. The label coloring is so helpful for my action items (email). Is there a way to open the selected message for reading? I guess it would cause problems if you had more than one message checked, but I'd really like to be able to tab to a message, check its box, and open it. Or even better, tab to the subject and hit enter to open it. Has anyone else noticed that the macros work in the attachment filename for replies only ? the regular shortcuts should suffice. The macro script is great. I had the "delete" button, but this one is way beyond. I love it. I have one query. In the gmail-macros.user.js, I can see "REMOVE_LABEL" const, but not it's usage anywhere in the script. How to give a shortcut for it ? Anand, the REMOVE_LABEL command is meant to be combined with a label name. It's very similar to the APPPLY_LABEL command, which the script uses already. Yes, that's exactly what I was looking for. Thanks! Thanks Mihai, but I could not get my intention done. I am rephrasing my query with an example. what key shd I press to unlable them ? pl note that I am at inbox still and 'y' key will archive them. This macro script has helped me a LOT, as I am a keyboard feak, but this one seems to be eluding me. I still can't get the "gmail fixed font toggle" to work. There is no button to be found. I am using Firefox 1.5.0.1. 'Toggle font' text on right side below 'Expand all' in message view. Any chance of getting you to update your bloglines to del.icio.us greasemonkey script? I just found it last night and it doesn't seem to be working. I assume it's because of the same greasemonkey upgrade. Or are you going to tell me to go use Google Reader? Thanks for the cool scripts. Thanks for all the great extensions. I completely abandoned GreaseMonkey after my GMail scripts (only ones I used) - were consisitently broken. This is just TERRIFIC news and a the entire reason I'm about to re-download GM. Thank you soooo much for this GREAT functionality! I absolutely love the gmail macros script... but it seems to crash firefox (linux) every 5-10 minutes. I know that others have had this problem... but has anyone found out how to fix it or work around it? I still haven't figured out how to implement a "remove label" hotkey though. If anyone has managed to do it, please e-mail me or post the solution here. Avery, that's what I am asking (abt "remove lable"), see post dtd Jan 18, still no answer. BTW, if you donot make any lable starting with "i", then pressing "gi" will take you to inbox. the latest script has this feature. The chat history update of Gmail seems to have broken all of these scripts. Can anyone confirm? Caleb, No such problem found. Scripts are working fine, even in 'Chat' history. The label functions stopped working for me today, I assume due to some change in Gmail because it happened on two different machines. Anyone else have this problem [perhaps same as reported by Caleb a week ago?] Other functions still work okay. Well no problem found with FireFox 1.5 and all the scripts. In fact I open both IE (for new Chat feature) and FireFox (for keyboard script) on same gmail id and work fine. Looks like the date on your update notice is wrong. Unless it's a very old update, strangely predating the article itself. There is a way to hide the color code in the label name panel? Not sure what was wrong before but they work on this firefox installation. D'oh, I still had 2005 on my mind when I wrote the update. It should be fixed now. If you read the first message in your inbox, and send a reply, then return to the inbox, right clicking for the preview bubble on the second message brings up the reply to the first message. Right clicking on the third message brings up the second message, etc. If you refresh Gmail, everything goes back to normal. Thanks for all the great extensions, hope this helps. If it gets updated, hopefully someone can also provide an update (or explain how to patch) KarlG's version? Hey, what happed ? Gmail macro not working ! Firefox 1.5 Greasmonkey 0.6.4 !! Any help how to enable it. And yes, it stopped working for me too. I'm completely lost. Here's a simple fix that worked for me. Or here's a patch [http://www.christilden.com/gmail-macros-fix20060316.patch]. Chris's fix worked for me, too; and I was desperate. Thanks, Chris! Thanks a lot Chris, I love gmail macros. Chris, you are GREAT ! I was feeling disabled without the macros. And yes my chat was showing disabled, that too is enabled now !! Weird - looks like Google switched it back to "tamu" - I think I may just save a separate copy of each and enable as appropriate if they keep changing it. Old habit, always keep backup, saved. BUT why google doing this ? Apply this new patch to Mahai's original script. It will then handle either scenario and you'll only need one copy. I am trying to add an "Unread" function. The script comes with the predefined const MARK_AS_UNREAD = "ru". But this is not working. I've updated my macros script to the new version (patch was clean, how nice!). I've additionally gone through the requests. I can't help the ? not working, it's worked for me on all platforms in the past three months. For the other concerns, the help info now should position itself towards the top of the screen, I've added a 'v' macro to mark as unread ('q' is taken by focusing on quick contacts). The 'o' expansion now returns focus to the conversation. I believe that addresses all the concerns. If you want to remove my 'o' command, do a search for '79' and comment out that block (8 lines in the updated file). I will not remove it because enter does the same thing and I actually use the expand all quite often. These are amazing scripts! Thx so much. 1. What's the "9000" after the "Label Selector" text when I hit the 'g' key? 2. I can't seem to get '?' to work to pop-up the Available Key Commands window to pop-up. Is that something that needs to be manually configed? I will wash cars, shine shoes and clean houses if there is any way you can help get label colors incorporated into Gmail as a standard feature. That is one of THE most useful features that I think would benefit every Gmail user, as the human mind responds to and distinguishes color a lot faster and easier than trying to track down a piece of text in a list of 25, 50 or 100 messages. Is there any documentation for these scripts? Im trying to find all available keyboard shortcuts that you get with the macro script but Im not seeing it in this post nor in the source. AKahn, the "9000" is just a joke. The '?' feature is available in Karl's version of the script, you'll have to read his comment to install it. Incredible script. I only installed Grease Monkey today, but already doubt I could live without it again. I'm using gmail to implement a GTD style personal productivity solution similar to that outlined in http://saw.themurdaughs.com/gtd%20with%20gmail.pdf and am making extensive use of saved searches. My next personal project will be learning js to implement the macros with saved search script, if no one beats me to it. I made few changes to have the '?' help box show properly in middle of page. Also changed 'V' to 'B' for mark unread, as 'V' is taken by 'View Conversation' script. I am having a problem with displaying the help screen. When I open it, I can only see the bottom two third's of the help window. The remainder is hidden under my toolbar. Any ideas? All credits goes to Mihai and Karl. Hope they add further new features to it. One thing I noted, however, was that when trying to install it, Greasemonkey didn't recognize the script (Firefox prompted me to download it). I believe it is because of the first line, "//~ changes by Anand". I moved that line (and the blank line after it) to after the line that says "// ==/UserScript==" and loaded it up into my browser. Greasemonkey recognized (and installed it) without a problem. Thanks OZ, though I did not had this problem here, anyway I will move that line below. Since a couple of days ago, the Gmail Label Colors have ceased to function after I leave my Gmail page open for a while. When I first open Gmail or if I do a complete refresh of the page (F5), the colors are back. However, after a while Gmail autorefreshes the page, and I lose the coloration. Macros work fine. Any ideas? Thanks! yeah, I am too facing this prob. now ! Any progress on the Color Labels? It really kills the experience of browsing Gmail when it is only blue and green! Anand, you seemed to be able to fix the Macros script, can you do anything with this? Or can someone tell me how to do it myself? I want to use Karl G's thing. For that I need to install the script and then patch it, right? How do I patch it? i edited the gmailmacros.user.js file to change one of the shortcut keys, but it did not take effect. (changed "U" to "I" for go to inbox). the old shortcut still works and the new one does not. what am i doing wrong? I like your label colour script, but there seems to be a bug. I'm unable to use the "remove label" function from the dropdown menu if the label has a colour assigned to it. I'm able to use the remove label button though. great scripts! just wanted to show my appreciation. The reason being that I use the spacebar to jump up and down the page and after using one of the select actions the input seems to still be trapping the spacebar somehow. Are there any plans for creating macros for the older oldest newer newest link buttons? I'm unable to install the labels script. i keep getting an error message from the browser. this isn't happening with any other scripts. i am running ff 1.5 and GM 0.6.4. Well, I was just thinking why Google searching history does not include gmail search, now it does, thanks to persistent search script! Thanks a lot! What about using your "l" macro for Saved Searches also? I have a Search for Unread messages and that is what I use most of the time. Thanks. Good work. >Can anything be done at the greasemonkey level to improve browsing/management of the contacts folder? Currently you cannot select contacts via keyboard shortcuts, and once you are inside a contact's details, there is no option to move to the next/previous contact of the found set. As well, any features which could help create some kind of databasing via keywords within Contacts would take gmail to another level. Thats all... anybody have some thoughts? Thanks again for phenomenal scripts... my productivity is about to increase exponentially! Just wanted to throw in my own thanks for the macros script. I've been using for several months now and...wow. How did I ever get along with out it? And, to top it off, I was getting tired of clicking between labels and just today found that I could do it with "g". Outstanding. What took me so long to RTFM as they say? Hi, thanks for the scripts!! I love using it. However, I'm getting confused which shortcut you're using and was wondering if you can compile a shortcut sheet like google? 1) "P" (purge) gets in the way of "n"/"p" in conversation view (to move among msgs in conversation)! I changed it to ";"
Know this would be more of a challenge but you've gotta admit it would be useful! I have GTDGmail installed (www.gtdgmail.com). Gmail Macros Quicksilver-like features work fine for labels like "stuff" but it wouldn't work for the prefixed version, "P:stuff". Besides, Conversation Preview Bubbles doesn't seem to work at all. Any idea how to fix all this? Astounding ! I never thought I could customize Gmail up to this point ! Can somone tell me how to delete an open email and go to next email opened? If this is currently not in, then how or where can i add in the script? Ahhh yayzerama for boosted productivity. Something I've never understood is why there aren't keyboard shortcuts for selecting "All," "None," "Unread," etc. How do you handle unselecting all messages w/out using the mouse? Any plans to incorporate something like this in your Greasemonkey script? Otherwise, great scripts -- improves the usability of Gmail thousand-fold. The script HAS the keyboard shortcut for Selecting "All", "None" etc., as M+A to mark all. Checkout the script uploaded by me, link given in earlier mail above. You can see the complete keyboard list in help screen by pressing ?. When I hit the tab key, Firefox grabs the command and sends me to the search box, and then the enter key causes an empty search string event. So, instead of sending, I get prompted to either save the draft or discard. Eeek! @Anand -- thanks for the reply! i did not know about the "?" help functionality. i'm in the same boat as Amit. is there a way to delete an open message AND open the next message with the same keystroke? basically, "t" + "o" combined, but only when you're in the message-view mode, not in the inbox-view mode (damn, i sometimes wish gmail had a preview pane mode). I'm in the same boat as Marek Kowalczyk. I have GTDGmail extension installed and I have the same problem with my labels using the label selector; doesn't work at all. The Conversation Preview Bubbles doesn't work for me either. 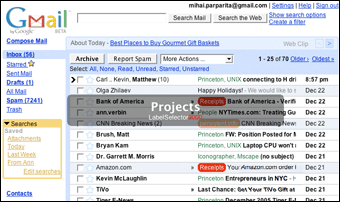 This would be great to get into GMail itself! using Gmail Macros with FF 2RC3. All of a sudden "g + label" doesn't work for me, i.e. the label selector shows up, type label, enter, the command doesn't lead me to the desired label. Any ideas? Anyone else seeing the same? has a fix been found for the issue regarding the auto-refresh loosing the label colors? i love this script. thanks. echoing frank's concerns... i think google changed a few things. g + label doesn't work. haven't found anything else, but there may be others affected. I have the same problem, but I also switched to Firefox 2, maybe that is the cause? Google changed Gmail. I'm still using 1.5.0.7 as I have for a while now and some shortcuts are broken for me too. Thus far it looks like only what jay mentioned is broken, specifically going to labels with the G key and marking items with the M key. 'v' in Karl's Gmail Macro makes Gmail Conversation Preview unread Gmail previewed, and do not discard emails, so I have changed the unread key to 'd' and updated the help screen activated by '?'. It should represent the most updated Gmail Macro script found in here and userscript.org. I meant I do not discard (archive) emails, so 'd' is freed up. Still, the label pop up is not working, so I changed it to use the key 'h' so that 'g+?' still works. Now, the nearly alphabetically ordered keys on keyboard: d,f,g,h,j,k,l are all used, as well as other keys; only 'q' and 'z' are unused. Feel free to customize them too. Thanks to Mihai for such great script which should really be officially incorporated in Gmail to avoid problems when Gmail updates. Another vote for fixing the scripts, specifically the Macros script. Has anyone else had trouble going to a label or inbox? I press g and the box pops up. I type and the name is completed and the box goes away. But then nothing happens. Excuse me for multiple postings. Given some more thought to the key selection now: same as Anand's version (for those who have been used to the 'e' and 'd') but changed unread from 'v' to 'z' (preview by 'v' and undo read is similar to Ctrl+Z), changed label pop up from 'g' to 'h' (to free up the default function of 'g' until label pop up is fixed), and changed expand/collapse to ('o' better stands for 'open'). The contents, wordings, color, position and size of the help box triggered by '?' and also the "cheat sheet" are updated. 'm' and are still not working though, and it would be nice to have a key equivalent to pressing the 'discard' button (without going back to the conversation list). Given some more thought to the key selection now: same as Anand's version (for those who have been used to the 'e' and 'd') but changed unread from 'v' to 'z' (preview by 'v' and undo read is similar to Ctrl+Z), changed label pop up from 'g' to 'h' (to free up the default function of 'g' until label pop up is fixed), and changed expand/collapse to ('o' better stands for 'open'). The contents, wordings, color, position and size of the help box triggered by '?' and also the "cheat sheet" are updated. 1. changed expand/collapse to "Enter"
As Boris pointed out, "m" (unstarred) is still not working, and is the most important macro for me. If this this could be fixed, that would be excellent. I believe that Karl's mod to the script allows the M and G shortcut keys to work just fine. You can find it in this thread. Feel free to join, chat, upload files, etc. Press ? for the list of shortcuts. Karl's corrected script now working for me - THANK YOU KARL. thank you for the update. much appreciated, really! One quirk so far though: I can't get '?' to bring up any kind of help/list of shortcuts. Try pressing '?' repeatedly. Sometime, help do not pop by press it once. How does this g thing work then? I press it and type in a label, but after I hit enter nothing happens. Also ? doesn't work. I presume this lists the gmacro functionality in full since I haven't seen it detailed in this post. There still seem to be some issues with the script. The "?" function does not work for me either, not even after repeated hitting. :-) But worse is the GTDgmail deficiency in the label selector. That's really a pity: labels like "S:Next_Actions" will not be recognized. Could it be that the folks of GTDgmail use special label prefixes? BTW, hasn't there been a way to see a popup with all applicable labels? Try disabling any other script and enabling only macro script, and then see if it works ok or not. May be the other scripts are clashing with this script. For the life of me...I cant change the individual labels color. Anyone has some code examples? the html color code for the green title 'persistent.info' at the top of this web page is '82CC33', but u can not set it as u will have to write '#8C3' which will be a bit different green. which will give blue color label "Bookmark"
Anand -- As with Jeff, I can't seem to get colored labels to work at all. I have tried naming the labels with the color syntax as shown, as well as patching the GM script to hardcode colors. Any ideas of what else to try? I'm using GM0.6.6 and FF1.5.0.8. GM and FF versions are ok and match with mine. Label any mesg as "Bookmark ##00f"
GMail shd display "Bookmark" in blue background color against that mail. Okay; turns out I did have an older version of the script. The updated one works. However, when trying to tweak it, I believe I discovered a bug -- one that absent further modification would probably only cause a slight performance hit, if anything. This script is great. The one thing I'd like to see added is the ability to toggle off all selected messages ("None" on Gmail). I am new to Greasemonkey (just barely downloaded the scripts this morning) so haven't gotten to the point where I can do this yet, but I thought I'd mention it here in case anyone else knows an easy way to do this.